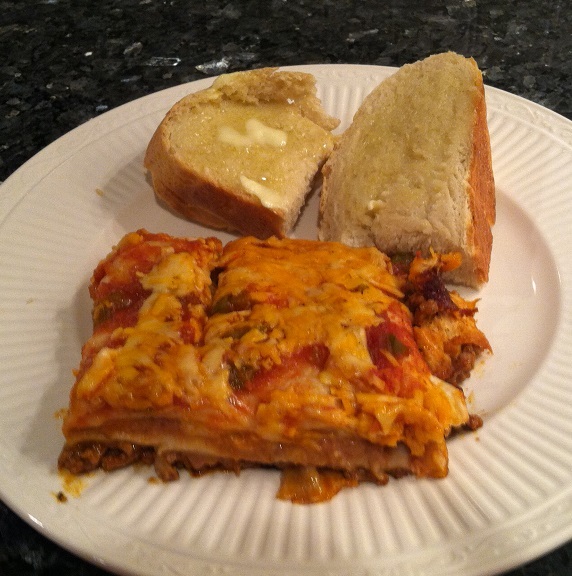 With all of this cold, Cold, COLD weather, I was on the hunt for some nice, warm, comforting things to make for dinner. Did I say it’s been COLD? Way below normal temperatures. I left the house Tuesday morning and it was minus 11 degrees. I think the high temperature that day was 8. It’s getting a little annoying. ( And to top it all off, I can’t seem to find the right hat to wear. I have a several completed knitted hats but none of them was just right to wear. Either I thought it looked silly on me or it was too big. Or it looked silly on me. Mostly that.) So, to combat the annoyance and the cold this past week, I cooked up a storm. Very yummy and warm and perfect for the weather. Especially since it has some heavy cream in it! I made half the recipe and tried not to put too much half and half. But did not skip the splash of heavy cream at the end. It was also good re-heated. 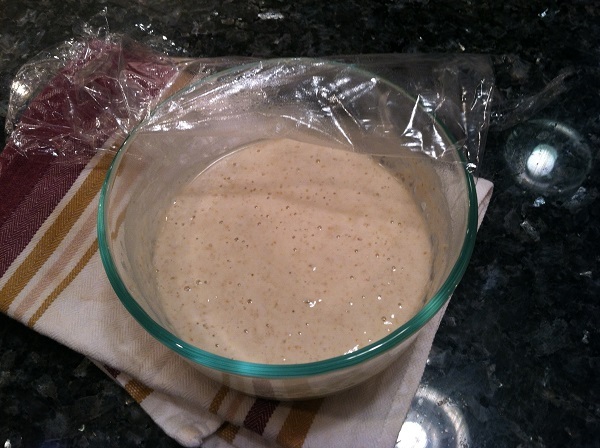 Sourdough starter! 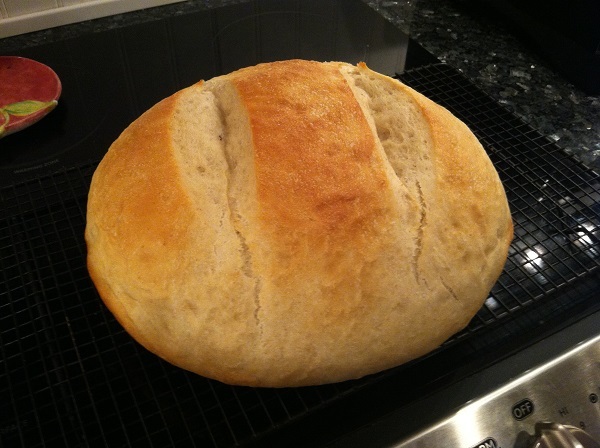 I made the most wonderful loaf of crusty chewy sourdough bread. In a pot! It was so easy. Next time (because there will be a next time. Maybe this weekend.) 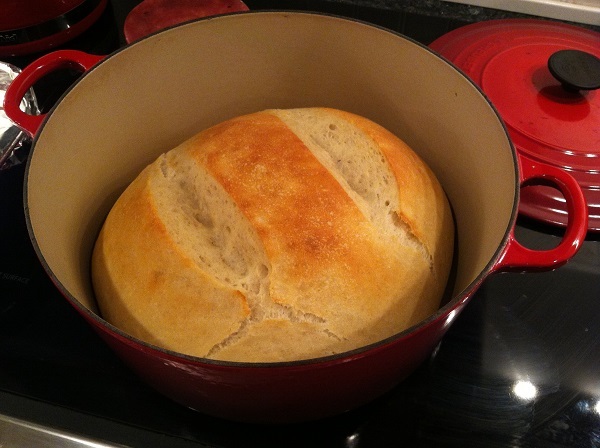 I will make it into two loaves and cook it on a baking sheet so I can freeze a loaf. And yes, I could have cut this in half and frozen it, but it was way too good and we just kept heating it up and toasting it and eating it. 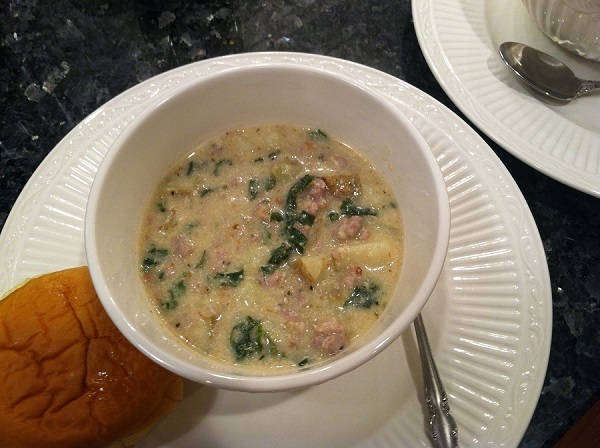 And yes, I should have made it on the same day I made the soup, because it would have been better to eat sourdough bread with the soup, rather than a hamburger roll. 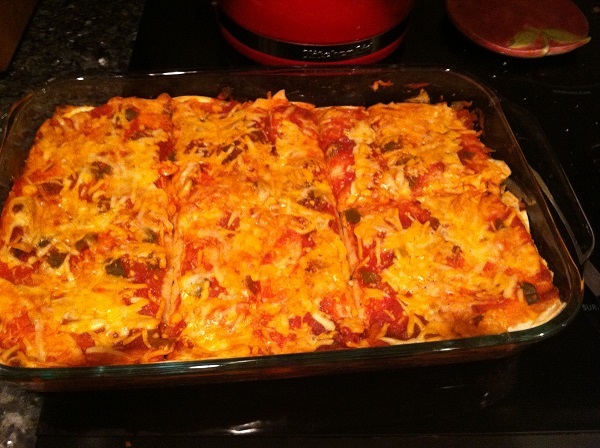 It was very yummy and I will definitely make this one again. Ok. 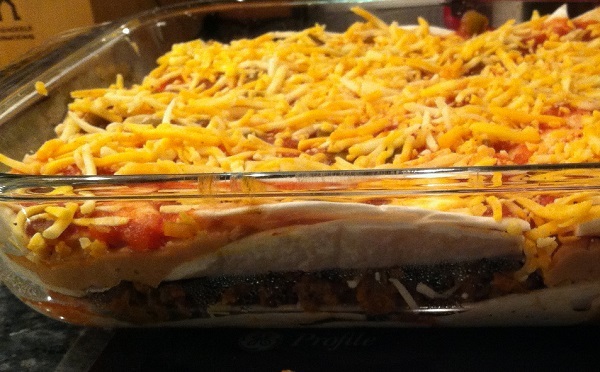 So, we covered soup, bread and burrito casserole. On to knitting! 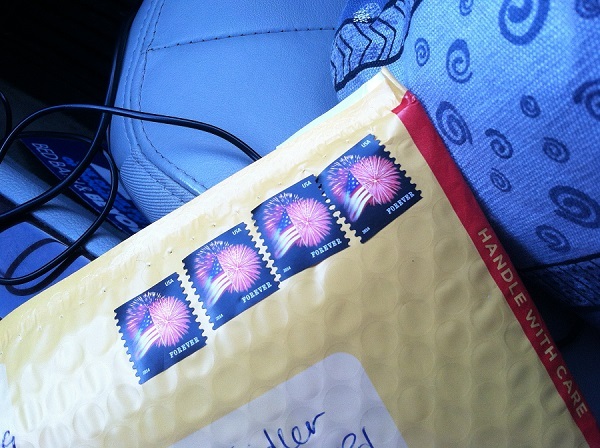 That is the picture with not enough postage and it got sent back to me so I’m trying again today with the correct postage. That’s what I get for trying to weigh it (with my new yarn scale!) and calculate the postage based on the USPS’s kind of confusing postage calculator. 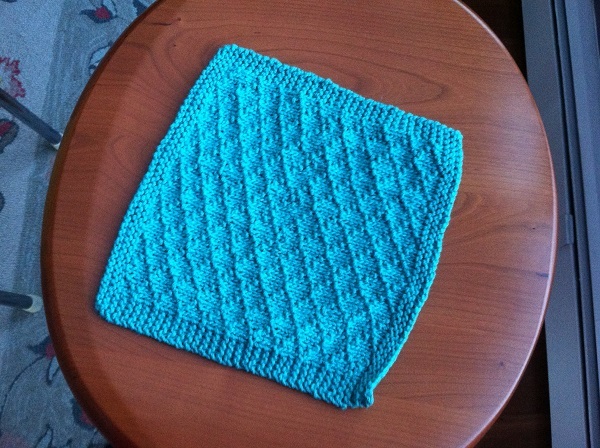 Then I knit up a dishcloth for my mother-in-law. She loved the last one and wore it out. Then my mom asked me to knit a hat for her, like the one Avi is wearing in this cool a capella video. (Need I go on and on about Home Free, who are great?). I found this pattern for her but now, she might knit it herself! These are my Cocktails for Two Mystery Socks that I started last January 31. They are HARD to knit. They are CONFUSING to knit. 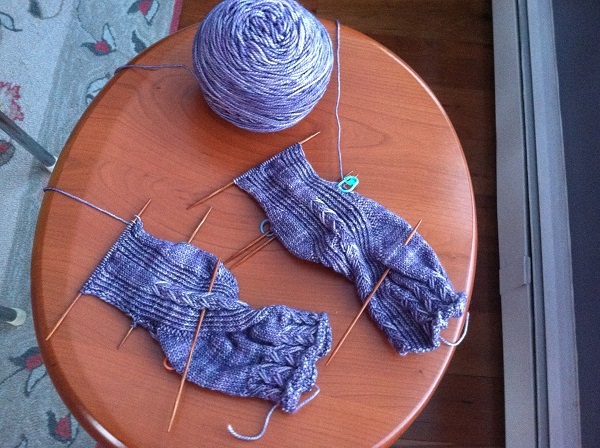 Mostly because I am trying to knit both socks at the same time and they are mirror images, so the instructions for each sock at each point is reversed and different. And every time I pick them up after not having worked on them for a while, it takes me 10 years to figure out where I am, on which sock, and what I’m supposed to do next. I have picked them up again because The Knitter’s Brewing Company is having another mystery knit-a-long starting this January 30 which I would like to participate in because I like Knitter’s Brewing Company and Wendy’s designs (especially these Snow Dancer socks which I’ve shown you before and also really want to make). However, I have it stuck in my head that I really should finish these other ones first. I love them. I love the finished product, which I have seen because my friend Lisa participated in that knit-a-long and finished them a really long time ago (over-achiever that she is – ha ha! Anything less than a year is overachieving to me, at this point.) and they look great. I’m wondering if I can get them done by the end of this weekend. HA! I’ll let you know. 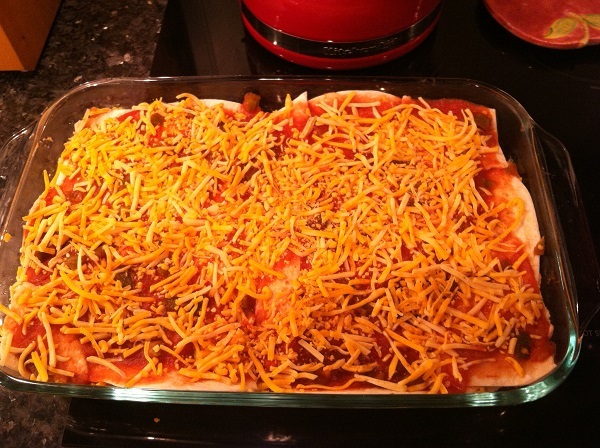 Posted in Uncategorized and tagged beef burrito casserole, cocktails for two, dishcloth, sausage potato and kale soup, sockhead hat, sourdough bread, sourdough starter, third mitten on January 16, 2015 by lizytish. Everything looks delicious!!! Good job! So cold your right, can’t take it any longer.